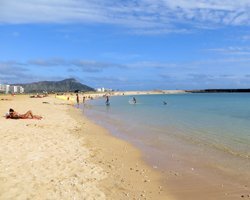 Hawaii Beaches: Magic Island Oahu. The Unintentional Beach Park that Everybody Loves! 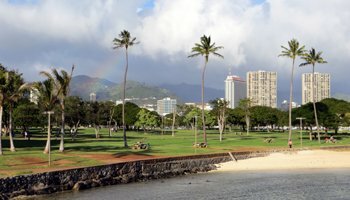 For starters, the picture across the top of every page on this site was taken from Magic Island Oahu looking back across the park toward Waikiki. That picture may tell you everything you need to know about this popular Hawaii beach park. It's gorgeous... especially in the late afternoon! The 30-acre peninsula that is Magic Island Oahu was initially constructed in 1964 to be the location of a luxury resort complex. The land was literally reclaimed from the sea by building atop a shallow reef. Then the resort was never built (thank goodness) and the newly-created land was repurposed as a public park. In 1972, the park’s name was officially changed to Aina Moana, meaning land from the sea; but in 30+ years of living here, I don’t think I’ve ever heard anybody call this park anything other than Magic Island. 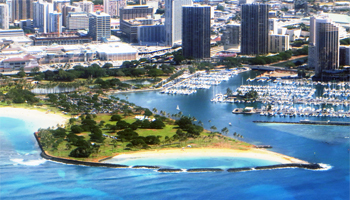 Located at the east end of Ala Moana Beach Park, Magic Island Oahu would have made a spectacular resort! Instead, it’s a fabulous park! This centrally located site has hosted countless barbecues, parties, weddings, events and more! There are plenty of shade trees. Paths throughout the park are in constant use by joggers. The park has its own sheltered lagoon; and the surf just beyond the peninsula can be some of the best in Honolulu. 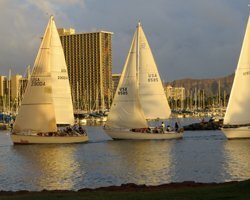 The Ala Wai Boat harbor opens to the ocean along the east side of the peninsula; and every Friday at approximately 5:15pm, there’s a weekly yacht race officially called the Friday Night Champagne Series but popularly known as the Beer Can Races. The course runs from Ala Wai Harbor to the channel entrance buoy at Honolulu Harbor (or to the Diamond Head buoy, depending on commercial shipping traffic in the other direction) and then back again. Although there are prizes (cheap champagne) awarded to the top three finishers, this is not your typical regatta. Think of it more as a sail parade. And if you think you’d really rather be on one of the boats, post your interest here, and you might get lucky. 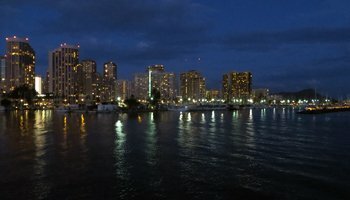 When the boats return to harbor, that means it’s almost time for the Waikiki fireworks; and Magic Island Oahu is one of the best places from which to watch! The show starts promptly at 7:45pm. Enjoy!